153 Commercial Real Estate and Properties in Bundaberg And Wide Bay are listed in 9 categories. We have 48 Industrial Warehouses for Sale , 29 Development Lands for Sale , 22 Retail Shops for Sale , 18 Offices for Sale , 18 Other Commercial Properties for Sale and 9 Showrooms for Sale . Great opportunity on a big block 1821m2. It is comprised of two houses located in the historic Maryborough on the Fraser Coast Region. Two adjacent houses can be combined to sell together with a FAIR PRICE. Buyers can purchase these two properties, one for self occupied and another to rent or rent both out while awaiting further land appreciation in years to come. 166 Pallas Street (2bed/ 1bath/ 2car/ 1012 m2) receives $260 p/w rent with a good long term tenant. Approximately 5 months remaining on lease.The owner fully renovated the large house and cleared, raised, landscaped and fully fenced the large block. The house is a beautiful with character which it is better to be removed and relocated if any new development occurs in future. 33 Degilbo Street (2/1/1/809 m2) receives $240 p/w rent with a relatively new & tenant is on a 6 month lease. The house is a refurbished colonial character home which can be removed and relocated. The owner has just finished some maintenance to ensure the house remains in good solid condition. It could do with some minor cosmetic improvements (paint etc) to add value. Together both properties sit on 1821m2 with three street frontages. Opportunities for future development by either removing both homes and building units, town houses, commercial/retail or put another house between the two. Please Contact Agent for details: Justin 0400 335572, justin.cheng@yong.com.au Note : All information contained herein is gathered from sources we believe to be reliable, however, we cannot guarantee its accuracy and interested persons should rely on their own enquiries. Prime Industrial Land on Shute Harbour Road is a very rare opportunity. The land area is 4046 m2 and has easy access for large vehicles. Development Approval for Mixed Industry and Business area has been obtained and remains current and is available upon request. Rental income from the existing tenants is sufficient to cover Council Rates. This is a unique opportunity to buy a long established, thriving business that could do with an injection of new blood to help grow the business. A new owner has three options: Purchase transport business plus a 4br home including a 150m2 shed for $410,000 Purchase transport business plus 16,100m2 (4 acre) land incl 300m shed $495,000 Buy transport business, home plus 4 acres land – the lot! only $755,000 Gin Gin is a beautiful town on the Bruce Highway and only 40 minutes from Bundaberg and mid way between Brisbane and Rockhampton. Gin Gin could be the perfect treechange for someone looking to escape the traffic, noise and hustle of the big city. It is also an ideal place to raise children and to create the perfect work/life balance. We have a brilliant reputation throughout the entire region with fantastic customer satisfaction ratings because of quality service. We operate 4 trucks with a spare truck as backup which are included with the sale as well as a forklift. We have a long list of established and regular clientele and have almost a monopoly on transport in the region. The business currently only operates on a five day week and this could easily be expanded into the weekend and instantly generate additional income. Current turnover is in excess of $430,000 and we generate excellent margins. Features of the business: Iconic local courier and transport business based in Gin Gin Queensland Property 1 includes a 4br home plus a 150m2 lock up shed Property 2 is a 16,100 m2 (4 acre) block of industrial two street frontage incl the Bruce Highway with a 300m2 shed, electric doors, office, toilet, well & gravel parking Sale includes 4 trucks plus a spare in excellent mechanical condition and 1 forklift Immediate opportunity to add additional income by operating on weekends Almost unlimited growth potential Whether you are an existing transport business owner looking to expand or an owner/operator looking for a tree change then this is the perfect business. The transport business is well established will real growth potential and the real estate can be developed to become income producing. For a confidential discussion, please call the number above TODAY! Bargara Beach Da For Subdivision For sale by Offers to Pur..
Development Site - The Gateway To North Queensland $300,000 + GST (if applic.. The owners are consolidating their investments and present this commercial property to the market. Multiple Tenants, spread you risk Quality and Diverse Tenants and Established Businesses High Return on Investment (ROI), approx. 8% yield (on information supplied) High Cash flow Enquire now, do your sums and then make your purchase. Call the exclusive listing agent Brant Duff on 0413 136 857 now for more information. 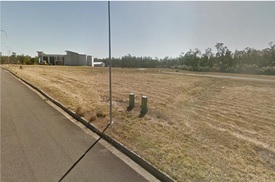 Central Queensland Location. In this Bundaberg Industrial Park is this extra large prime industrial lot. If your business is growing and run out of room for expanding your operation then it's time to consider a move to a more central location. Take a look at this: Features bull; 2.16 ha. bull; land suitable for light to high impact industry. bull; Excellent for large vehicle and b double access. bull; Fully fenced. bull; Water and power on the Street. bull; B Double access rout North and South off Ring Road. bull; Would suit a variety of industrial users. Don't let your project stall because of lack of room Call the listing agent John Pappalardo on 0427875396 today and secure your business future. 1205SQM Prime investment in the Main Street CBD BUNDABERG with Major Car company as your tenant. bull; Same tenant 20 + years. bull; New 5 year lease 1St of August 2017 with 5 year option. bull; Tenant pays 100% of Outgoings. bull; 1205Sqm 6 title Corner location. bull; Hardstand + Sales display building bull; Air Conditioned reception showroom and office. bull; lunchroom and toilets. To inspect this property please call the listing agent John Pappalardo today on 0427875396. 4.05 hectares plus 850m2 home site Zoned low density residential DA approved for 87 Multiple Dwelling Units and Central Facilities Holding income Fronting the Gympie Road Highway and directly opposite a School this DA approved site is in a prime location for a great price. Hold the income from the rented homes, develop as multi homesite (RV park or similar) or change the use to suit or combine with the neighbouring 2 hectares for a larger site. Recently reduced in price to move, this site will not last long. Call The Commercial Guys today to book your inspection or for further development information. Unless otherwise stated, the price/property may be subject to GST. This great property on Bourbong St is available now. Divided into 3 Shops Fully Tenanted Current Leases established 2004 2006 and new 2017 Car parking Area to rear of the property plus Easement Access to Woongarra Street Amenities Block to rear with separate Toilets for each tenancy The owner is keen to sell and will consider any reasonable interest in this building. Call the exclusive agents Brant Duff John Pappalardo at Ray White Bundaberg for further information and to arrange your inspection. 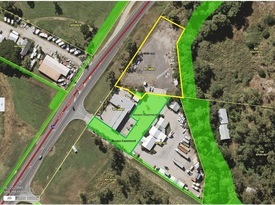 Bundaberg East - High Profile - Industrial Land And Buildings- 8094m2 $550,000 + GST If applica.. The owners of this great site have decided it's time to sell. Renovated office complex 88m2 , air con, Toilets Large Covered Shed 424m2 Plus 2 separate sheds 58.5m2 and 37.7m2 hardstand area, Fenced Versatile Industry Zoning with 8094m2 Visible and with easy access Princess Street, CBD and Ringroad Approx. Call the Exclusive Agent Brant Duff for more information and to arrange an inspection. The owners needs have changed and the offer this commercial property to the market. Air Conditioned Offices Mezzanine Floor amenties, onsite Parking High Clearance 106m2 floor area plus Mezzanine approx. Perfect location for your small to medium business. Call listing Agent Brant Duff now to arrange an inspection. 9413 M2 - Zoned General Industry - Southern Entrance To Bundaberg $500,000 + GST If applica..
With great exposure from the Highway across the Airport this large parcel of land is presented to the market and must be sold. improvements, including self contained office 66m x 140m level, fully fenced Zoned General Industry Weighbridge and Shed not included but maybe available 'by negotiation' approx. The owner is pursuing other investment and is looking to sell the last portion of this Industrial lot. Call the Listing Agent Brant Duff for information and to arrange an inspection. 'well Equipped' Commercial Office Near City Centre o/a $399,000 plus GST if .. This property has just become vacant and is ready for a new tenant or owner. Purposely renovated for the previous tenant it could be perfect for you without major works. THIS PROPERTY IS AVAILABLE FOR SALE AND LEASE Situated in Watson Street and between Busy Barolin Targo Streets you new business with be easy for your clients to find. Doctor, Accountant, Book Keeper, Allied Health so many potential uses. NOTE: All Audio Visual Equipment and furniture not included. Ramp Access to Reception NDIS perfect Large Boardroom, Photocopier Work Area 4 Offices, Work areas and Storage 2 Toilets including 'Accessible' Toilet Computer Network throughout Full Kitchen, Commercial Grade floor Coverings Ducted Air Conditioning Throughout The office has been extremely well fitted out and could allow your business to move straight in and start operating with minimal outlay. Call Exclusive Agent Brant Duff to discuss and arrange an inspection. Retail/commercial Development Opportunity On Bruce Highway $320,000.00 + GST (if app..
Freehold Waterfront Land  Zoned Marine Industry Expression of Interest Cl..
Ray White are proud to have been appointed to sell a Freehold' commercial site in the Bundaberg Port precinct. Land Zoned 'Marine Industry Dry' Freehold 5514m2 Water Zoned 'Marina Operations Wet' Lease up to 25years 3773m2 Close to Bundaberg Port Marina and proposed Barubbra Shores Development Long list of possible uses detailed in Information Memorandum visit raywhitecommercial.com.au/1724436 for full details Approx. The Bundaberg Port is growing rapidly with strong commercial activity and increasing export activity. Major recent announcements enhance the prospects for any new business. Call Brant Duff from Ray White Bargara on 0413 136 857 for more information. This prime 'high density residential' zoned 4048mÂ² esplanade development site in popular Scarness features: â¢ 40m street to street frontages to Esplanade & McKean Rd; â¢ Current development approval for a 39 unit development; â¢ Alternate uses S.T.C.A (motel complex, low rise gated community units); â¢ Holding incomes from 4 x residential units; modern office complex and a detached 4 bedroom dwelling; â¢ Immediate vicinity to some of Hervey Bay's most popular restaurants, clubs and cafes; â¢ Just 100m to the Beach House Hotel and Scarness pier; & â¢ Opposite arguably Hervey Bay's most popular swimming and walking beaches. The property is being offered for sale by tender with tender documents available from the exclusive marketing agent Tony Sprake. This is a rare opportunity for you to achieve one of the Fraser Coasts best development opportunities so don't hesitate! Located along arguably Hervey Bay's most popular foreshore precinct this premier development opportunity is one of the best opportunities currently available on the Fraser Coast. â¢ Features a versatile 1215mÂ² allotment with 2 street frontage â¢ 20m frontage the Esplanade and a further 60m frontage to Leslie Lane â¢ High Density Residential Zoning with the FCRC. â¢ Uses S.T.C.A (high rise units or combination of commercial and units) â¢ Adjoins an existing commercial premises and just walking distance to the Beach House Hotel complex. â¢ Panoramic ocean views across Hervey Bay and to Fraser Island â¢ Very centrally located and a very short distance to the Pialba CBD and Pialba Place Shopping Centres/Big W. The property is being offered for sale by Tender with tender documents available from the exclusive marketing agent Tony Sprake. Opportunities such as this don't come along all that often so don't miss your opportunity to acquire this brilliant piece of coast real estate by lodging your bid by no later than the close of business on 29th September, 2017. Ray White are proud to have been appointed to sell a Freehold' commercial site in the Bundaberg Port precinct. 150M Water Frontage Land Zoned 'Marine Support/Commercial Dry' Freehold 1.095ha or 10950m2 Water Zoned 'Marine Operations Wet' Lease up to 75years 1.586ha or 15860m2 Adjoining Bundaberg Port Marina and proposed Barubbra Shores Development Long list of possible uses detailed in Information Memorandum. visit raywhitecommercial.com/1718359 for full details App. The Bundaberg Port is growing rapidly with strong commercial activity and increasing export activity. Major recent announcements enhance the prospects for any new business. Call Brant Duff from Ray White Bargara on 0413 136 857 for more information. This property is being sold by Expressions of Interest therefore a price guide cannot be provided. The website may have filtered the property into a price bracket for website functionality purposes. Disclaimer: Ray White has not independently checked any of the information we merely pass on. We make no comment on and give no warranty as to the accuracy of the information contained in this document which does not constitute all or any part of any offer or contract by the recipient. Prospective purchasers / lessees must rely on their own enquiries and should satisfy themselves as to the truth or accuracy of all information given by their own inspections, searches, inquiries, advices or as is otherwise necessary. No duty of care is assumed by Bundaberg Stock Property P/L t/as Ray White Bargara divisions toward the recipient with regard to the use of this information and all information given is given without responsibility. bull; Current use professional Offices. bull; Approx 220SQM office. bull; 1012m2 site. bull; Wheel chair access. bull; Carpeted front reception. bull; 5 office spaces. bull; Meeting room. bull; Kitchen. bull; Internal separate toilet. bull; 3m x 12m garage storage. bull; Air conditioned. bull; Insurance is approx $1,000 a year. bull; Rates half year approx $3,959.05. bull; Not flooded 2013. For further information or inspection call the exclusive marketing agent John Pappalardo on 0427875396 today. New national tenant NORCO RURAL in place. Tenant pays all outgoing. Building: Works completed: $40,000 of new concrete car parking, $17,000 roofing and remodelled showroom. 270 m2 retail showroom and offices 1543 m2 high clearance warehouse total building area 2058 m2 exclusive use area of 3702 m2 , fenced hardstand and car parking around the building. direct access for B Double and Heavy vehicles off a main arterial in and out of Bundaberg. Approx. For an Information Memorandum or inspection call the exclusive sales agents John Pappalardo on 0427875396 or Brant Duff on 0413136857. This 5.3 acre Multi Option Development site is bulging with potential for capital gain and opportunity for a wide variety of buyers. Prime Bargara Road location, perfectly positioned in Bundabergs growth corridor between city and coastal communities. Previous D.A. 120 Bed Residential Aged Care Facility Favourable indication STCA^ for mixed use  Child Care, Medical, Neighbourhood Centre, Retail, Residential Lots Affordable Regional City  Emerging Communities Zone Retirement Demand Low Cost Lifestyle + City Services The futures looking very promising if you owned 5+ acres just 5 minutes to the coast and city. Our interstate clients are restructuring and determined to meet the market. Detailed Information memorandum available upon request. Here is you opportunity to secure your new address at a price that's probably cheaper than rent. Modern tilt slab, high Clearance Easy location in busy estate Amenities Act quick they are selling fast. Call the listing Agents Brant Duff John Papparlardo for more information. Any price will includes 10% GST. When it comes to your business, location can save you a fortune! bull; 1012m2 site 674.8m2 under roof bull; Approximately internal 670m2 area bull; Two freshly painted and carpeted offices bull; Freshly painted inside including both offices and mezzanine level lunch room. bull; All air conditioners have recently been replaced bull; Toilets renovated plus new carpets in the offices. bull; Ideal use: Warehouse, large office, freight Depot, Storage, and retail. approximately They just are not building these types of buildings in the CBD anymore. All contract offers will be taken into consideration and presented to the owner. One can only truly experience this property with an inspection. Please call exclusive listing agent John Pappalardo on 0427875396 for the next available opportunity to view to discover it's for yourself. This is an opportunity to relocate your business with all the hard work done. If you have ever looked into getting a property to this standard you would know this is no mean feat. Vacant possession As new condition 701M2 site 120M2 office space + out door area Concert car park with 8 car spaces Air conditioned Wheel chair access Disabled toilet Save yourself the time and money call now I only have one to offer. Should you require any further information or would like to arrange an inspection please give the Exclusive listing Agent John Pappalardo a call today.